The Rhodope is one of the most beautiful mountains in Bulgaria. It has a soft rounded shapes, with large meadows, which looked from a far, seems like covered with velvet, with old pine forests and above all a bright blue sky. The area of the resort Pamporovo can be defined as a sunny spot with its 270 sunny days per year. It’s a mythical Rhodope Mountain associated with many legends. The most famous is of Orpheus, Eurydice's love and the tragic end to this ancient love story. The mountain lies many stories that people pass on from generation to generation. The Rhodope Mountain cuisine is famous for delicious food, which we call organic and healthy. Famous are the Rhodope potatoes and the “patatnik” made from them. Big Smilyan beans is a favorite dish for every family. The Rhodope pies are unforgettable taste. It is due to the cheese that is produced out of the milk of free grazing in the mountain sheep and cows. Yogurt is a scent of the mountain. And last but not least, are extremely hospitable Rhodope people. These are mountain people who worship the greatness and majesty of nature. They are calm, haste slowly and are far from the stress. They live with the rhythm of the mountain and enjoy all the guests. Welcomed them with bread and salt and put them to sit at their table. Culinary course: will be revealed the secrets of delicious Bulgarian dishes. Spices will be herbs that you can pick up in the mountains. Vegetables will be of small gardens in the village, with a flavor and taste which you will ever search for. Cheese and milk are products made only from local cows and sheep. You will have time for walks in the mountains, to visit interesting natural places. Remember to take comfortable shoes for mountain. Now imagine one week of greenery, calmness and enjoyable activities. Clean environment, clean food and interesting program. A relaxing vacation and charging experience, which a modern man needs. Day 1 - Arrival at Sofia airport for departure to Progled village, situated among the Rhodope mountain, 1470 meters above sea level. The village is located on the mountain meadows, surrounded by pine forests. In those forests around grow many herbs, wild berries, mushrooms, berries. Traditionally each year the first Saturday of July is held a meeting of the people from the region and their families, which is a day-time event and takes place at the meadow near the village. An extremely picturesque place, with all that it is surrounded by fir trees. Pamporovo resort (one of 3 largest Bulgarian mountain resorts) is located 4 km from Progled. The trip from Sofia to Progled lasts 3 hours. Transport with a comfortable air-conditioned minibus. Meeting with bread and salt welcome an old Bulgarian custom and aromatic cup of tea from local herbs. Accommodation is in small family hotel with apartments furnished with style and private comfortable bathrooms. From the apartment windows you can overlook the mountain. Acquiring with the neighborhood. Dinner by the fireplace. The restaurant is in the style of the old Bulgarian houses where the family had gathered around the hearth at night (kind of an open fire). Interesting emphasis on this traditional atmosphere are the piano and the guitar, which are available to guests. Day 2 - Outdoor breakfast with homemade specialties, homemade jams and herbal tea from local herbs. Excursion to the Rozhen meadows and Rozhen Observatory. Very pleasant is the transition from the ridge above the village in his neighborhood to Karamanitsa. From there go to the Rozhen meadows, where near the road is situated chapel from which begins path connecting the village with Rozhen. Do not make noise and look over - is almost certain that you will encounter deer. To walk around the circle will not take more than an hour and a half. According to the season picking berries or gathering mushrooms. Lunch is delicious after walking in the mountain. At 15.00h - Culinary Course - under the expert guidance of local artist to prepare delicious dishes. 20.00 h - dinner. Serve meals cooked on the course, pleasant conversation by the fireplace, all this surrounded by the melodies of Bulgarian folklore music. Day 3 - Outdoor breakfast with homemade specialties, homemade jams and herbal tea from local herbs. At 9.00h - Culinary Course - preparation of traditional Bulgarian three-level menu: soup, main dishes and desserts. At 12h 30 - lunch with the prepared meal. At 20.00h - dinner and a bee. Bee is part of the Bulgarian traditions. In the past they have organized at the evening. Hostess invites friends to “sweet chat "and to help in any activity that was time-consuming. For example, cleaning of the corn cobs from the leaves or cleaning the beans. Another version of the bee was when everyone is caring some handiwork and work on it while chatting with friends. Besides talking to the participants in working-bees they use to sing a lot. In Bulgarian folklore songs is dedicated to the bee. Day4 - Outdoor breakfast with homemade specialties, homemade jams and herbal tea from local herbs. At 9.00h - departure on a trip to Smolyan. Go in Pamporovo, the largest mountain resort in Bulgaria. Then we continue to Smolyan. Viewing the city center. Free time for shopping and a walk. Return for lunch in Progled. 19h30 - dinner with the prepared dishes. Bee by studying some Bulgarian folk songs. Day 5 - Outdoor breakfast with homemade specialties, homemade jams and herbal tea from local herbs. At 14h30 - Culinary Course - festive Bulgarian cuisine. Day 6 - Outdoor breakfast with homemade specialties, homemade jams and herbal tea from local herbs. Free time to discover the area and say goodbye to the mountain. Day 7 - Last breakfast in the mountains. At 9.00h - departure to Sofia. Arrival in Sofia and accommodation in 3 * or 4 * hotel.Lunch. Walking tour of downtown ~ 3 hours. Dinner in a typical Bulgarian restaurant with folklore music. A bottle of local wine will be gifted. Prices depends on group size and periods. Please, contact us for price offer. Characteristic appearance of the town gives the architectural reserve. There by the National Institute for Monuments of Culture has registered over 100 architectural monuments of culture. Buildings in the reserve are characterized by its white walls around the courtyards with outdoor bed, round white chimneys and wide oak doors. In the yards of most houses have wells, surrounded by oak baskets with "dials" on the rope and tile roofs. In the old part of town is the Renaissance ensemble. In the architectural reserve was built Ethnographic Area Complex, which is an "live" exposition. It is located in one of the neighborhoods of Zlatograd, known as its "Old Town" - a few inhabited streets with houses in traditional architectural style. Some of them are converted into nice cafes and restaurants. Tired of walking tourists can experience a delicious meal to the sounds of melodies played by Rhodope bagpipes and to drink a glass or two of aromatic Zlatograd coffee prepared on hot sand. The recipe is still a family secret, but its taste is incomparable. Very interesting are the shops representing traditional crafts. Perennial, in authentic and appropriate interior are played on live all activities related to primary processing of wool, and cotton, the spinning, knitting, weaving - with vertical and horizontal loom, homespun, braiding and tailoring, cutlery, and production of Rhodope gourmet and drinks from Zlatograd. In the reserve you can see more than 100 years old sewing machine, and clearly be shown how the smiths do medieval swords. Logging in the cutlery shop, the master must give you the blue bead - lucky memorial. Zlatograd is the only place where goats’ horn is processed - it is attaches to the masterfully specially designed wooden handle. Watermill is one of the most attractive sites. Price includes: transportation, guide in English, tickets. Not included: personal expenses, food, drinks. • A trip to the planetarium and Smolyan - included in the program. One of the youngest cities in Bulgaria. While young, the city is full with history. These places hold memories of the Thracians with wonderful harps / believes that there is Orpheus enchanted the birds with his music /skilled Slavs tribe named Smoleni, which give their name to the city, brave Bulgarians who paid with their blood the love of God. Today the city is beautiful and long, and its center, completed only twenty years ago, is remarkable for its architecture and its modern form. People here are nice and polite, but extremely slow. This is rather a charm - no hurry, enjoying every moment of life among the beauty and freshness. In Smolyan there is a Planetarium, which is the largest in Bulgaria. There are lectures holds in several languages. • Rozhen Meadows - In the 19th century the meadows of Rozhen have gathered the inhabitants of the 3 surrounding villages – Progled, Momchilovtsi and Sokolovtsi to a family meetings. At that time Progled was in Bulgarian territory, the other two villages were under the Ottoman Empire. At these gatherings were collected separated relatives, singing songs to the accompaniment of a bagpipes, the Traditional roasted lamb is prepared on coals. Since those days the tradition goes back here to do festivals - Bulgarian folklore singing competitions. Rozhen became the biggest stage of the Rhodope song. Here rises the star of all the great Rhodope artists. Later Rozhen gathering turned into a national council, and performs competitive singing of Bulgarian folk songs. From all parts of Bulgaria are collected folk singers and instrumentalists who are singing and playing on several scenes of the biggest festival of folk song in Bulgaria. The fair is held within 2 days every 4 years at the end of August and was attended by over half a million Bulgarians and foreigners from all over the world. For the first time here was sounding "Hundred Rhodope bagpipes." Traditionally, the festival opens with the anthem of the Rhodopes "Bella sam Bella yunache" under the accompaniment of "Hundred Rhodope bagpipes." The culmination of a singing competition is the gala show "Zvezden Rozhen “when the evening of the first day under the bright stars of the Rozhen firmament, the biggest Rhodope singers sing the eternal Rhodope songs. The atmosphere of this evening is truly electrifying. Last of the Rozhen Fair was held in 2006, when the event was attended by over 100 000 people, and in a singing competition were involved over 6,000 performers from the country. Among the guests were representatives from Australia, Japan, Hungary, Poland and others. Not far from, east of Rozhen is situated the National Astronomical Observatory "Rozhen" - the biggest on the Balkan Peninsula. • Excursion to the Yagodinska cave and village Shiroka Luka - The road passes through the resort Pamporovo and takes along the river Shirokolashka. The next 16 km it follows the curves of it to reach the village of Shiroka Luka. 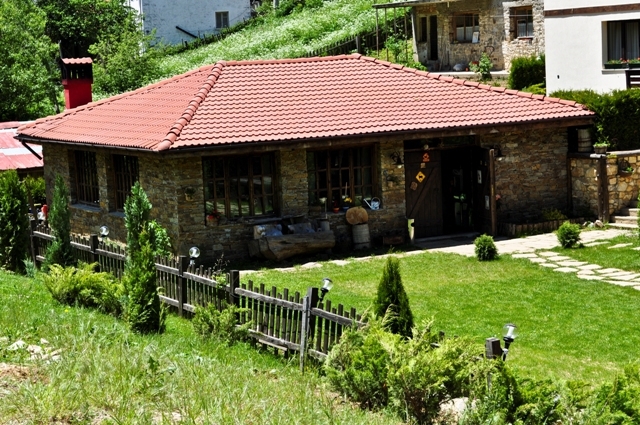 Shiroka Luka is known for its Rhodope songs (there are folk arts school) and Rhodope houses that are with very interesting architecture - such as "great Rhodope house." They have two floors, with bay windows and tall stone chimneys, thick walls, small windows, forged doors, wooden ladders and a small cellar with a hiding place. The rooms have hidden in the wall cupboards, closets and more. The courtyards are small, covered with plates, among them - a fountain. The village is declared an architectural and folklore reserve. In the village is the church "Holy Mother", which was built in 1834 (according to a legend the church was built in just 38 days). The iconostasis of the church is unique in its style. It is assumed that was painted by students of the famous brothers Dimitar and Zahari Zograf from Samokov. There is also a hypothesis that the brothers themselves were painted the church. Near the church is the old school, built in 1835. The road continues to follow the river to the west and then south to reach after 35 km to Yagodinska cave. Yagodinska cave is 10 km long and is placed on three floors, of which only the third (the lowest) is cultivated and electrified. For tourists it has built 1100-meter track. The entrance and exit to this floor are artificially dug tunnels, respectively 150 and 80 m.
The natural entrance of the cave leads to the first floor, where is found an ancient dwelling, occupied about IV-millennium BC. Findings suggest that it was the home of skilled craftsmen-potters. Clay is extracted from inside the cave and from the bed of the river Buinovska. Vessels were fired in clay ovens. Residents are forced to leave their homes after the collapse caused by an earthquake. The cave is unique with its numerous stalactites, stalagmites, "curtains", "leopard skin" (differently colored layers of rock), cave pearls. It has a constant temperature of 6 ° C and humidity 92%. Some internal layouts and remind of Santa Claus, Snow White and the Seven Dwarfs, Virgin and Child, Pijo and Penda, shapes of animals and fantastic forms. In the same hall are held 103 weddings. Price: 19 euros for a minimum of 6 pax.